Crisp, cool, gingery and refreshing. Plus a mystery solved! 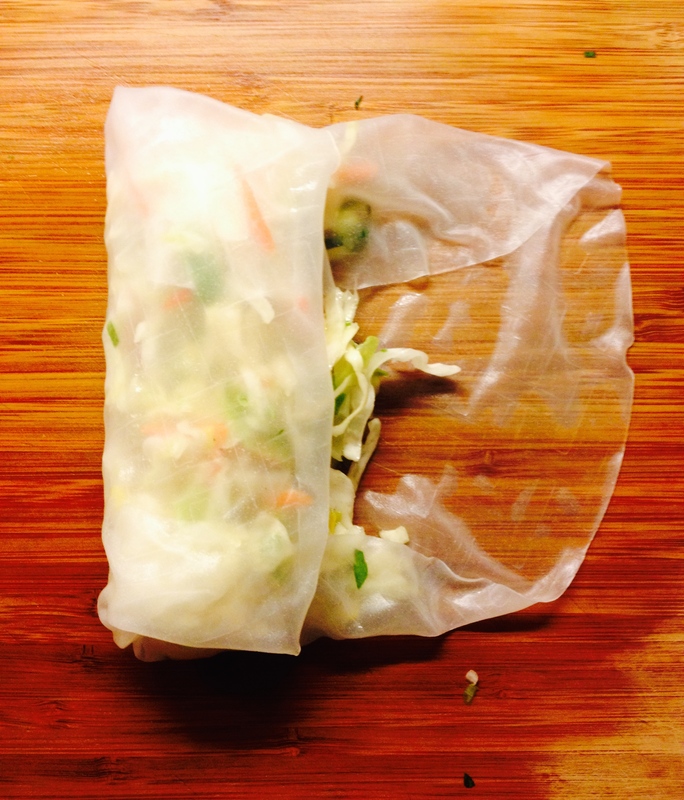 How do restaurants make those beautiful glass-wrapper rolls? IT’S SO EASY. 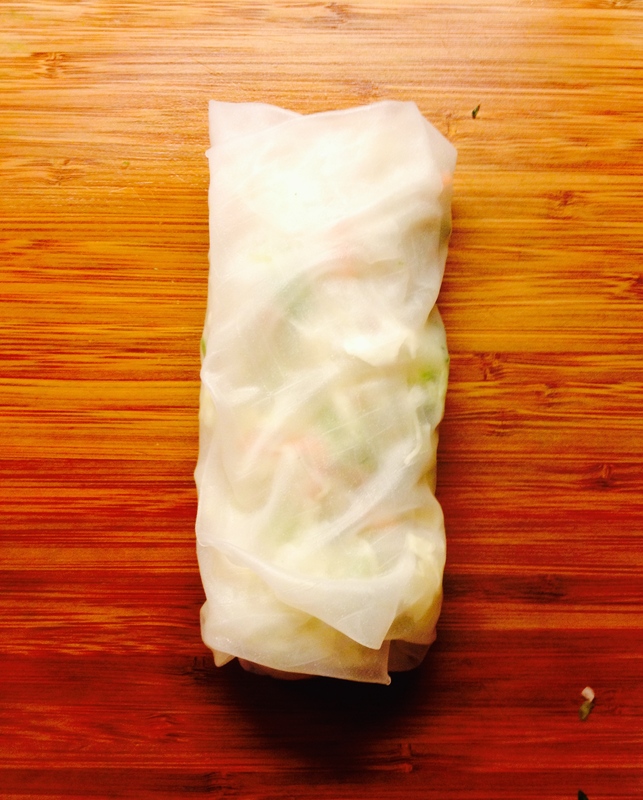 If you can roll a burrito, you can do this. Promise! We have even made this on a work-busted Monday night (we did make the Asian slaw on Sunday, a good make-ahead trick because that stuff gets better when it sits). This post is a little photo-heavy because I wanted to show you how to do it. Please comment to let me know what you think about having more process photos! 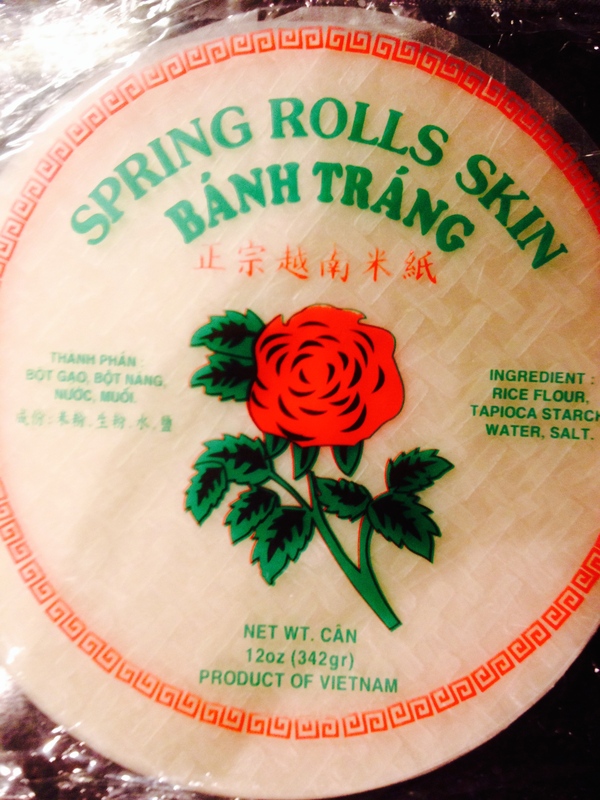 8-ish spring roll skins (rice wrapper) – like this photo, below – this package has lasted 3 rounds of spring rolls and cost, like, under $2. It’s on the shelves in your Asian grocery. 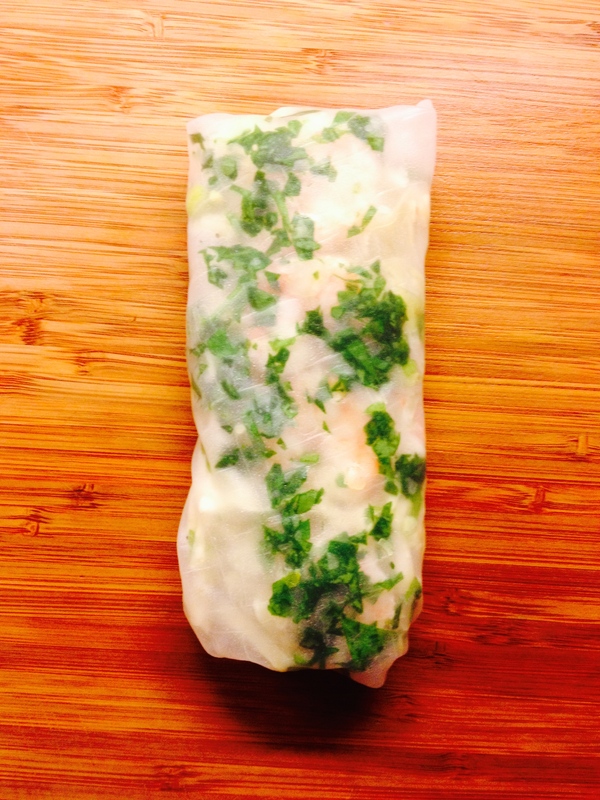 It’s different from the egg roll wrappers in the refrigerated section. 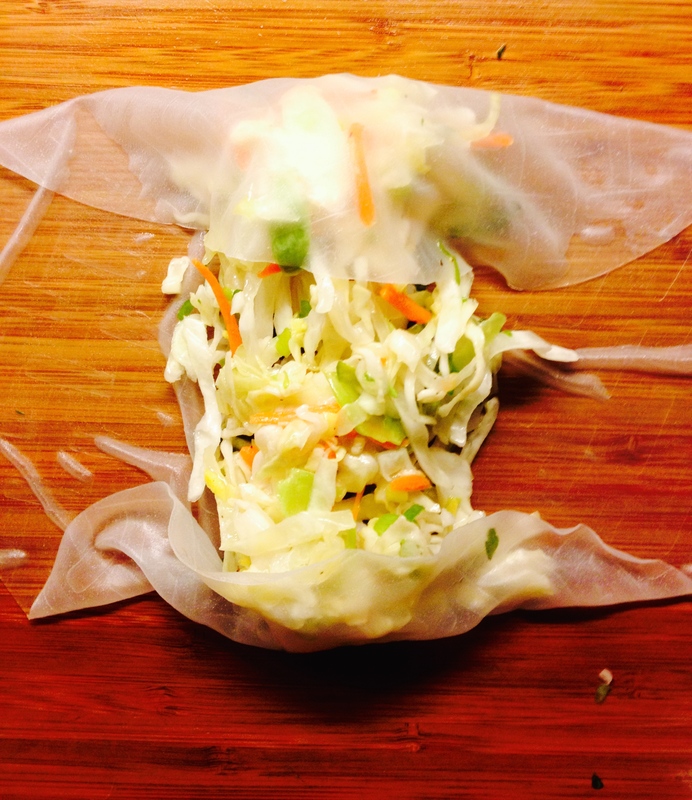 To make the filling: Make your recipe of radish*rose asian slaw with ginger, green onions, and sesame. 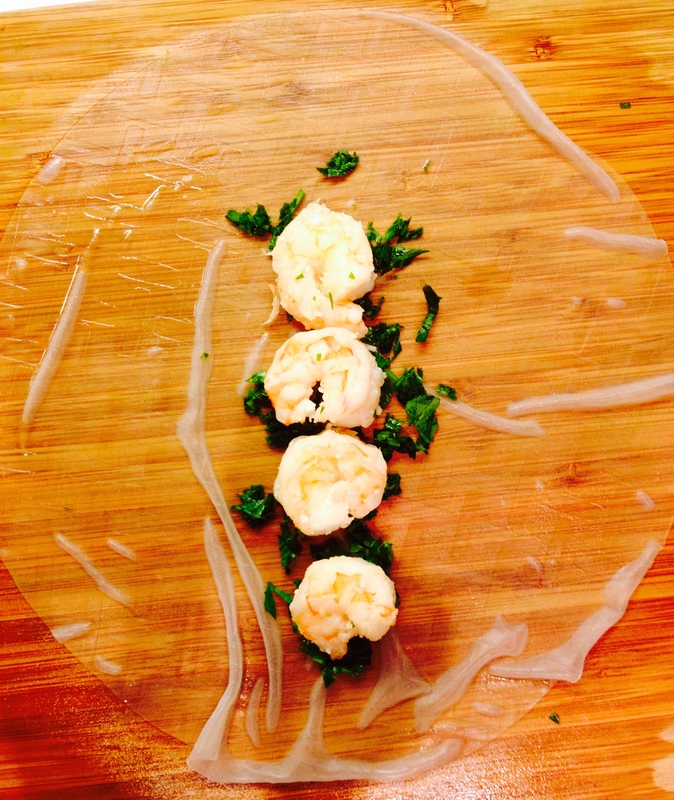 You will need to cook your shrimp, but gently because you want them to be soft, and not develop a crispiness or hardness. I steamed mine for about 5 minutes with a little salt, but you could also boil them. You want them to JUST stop being translucent and begin being opaque but try not to overcook them. I recommend having a bowl of cold water handy, so after you drain your steamed or boiled shrimp, you can put them in the cold water to stop the cooking. You want nice soft, pink shrimp. You do not need a lot of seasoning other than a sprinkling of salt. That said, if you over cook them a little, no biggie, because there is more going on here! So now you’ve got your slaw and your shrimp and your chopped herbs (cilantro or parsley). Let’s move on. 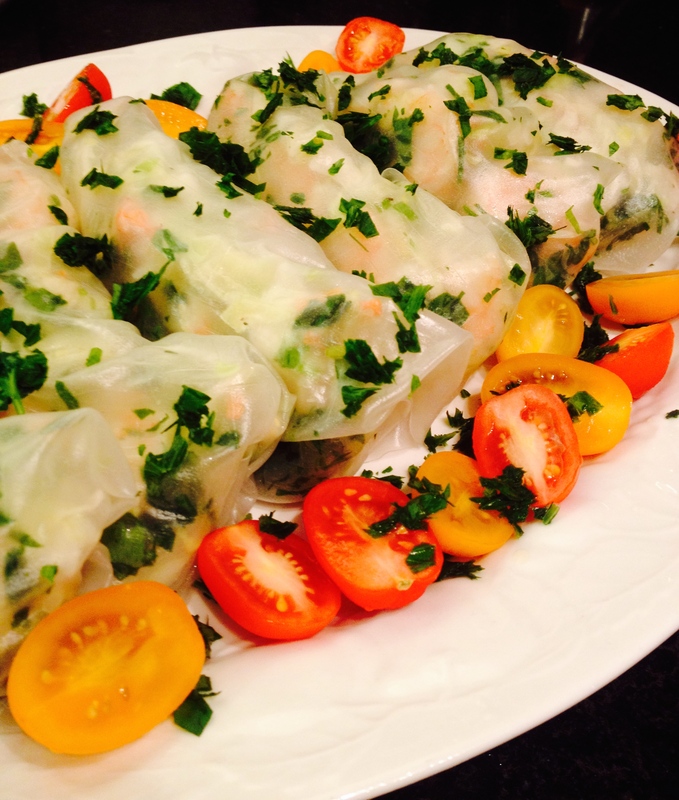 Step 1: Take your rice wrapper, blot off excess moisture, lay it on your cutting board, and sprinkle some herbs (or place whole leaves, so pretty), then 3-4 shrimp. Step 2: Fold in the top and bottom ends. You are basically making a burrito with 2 closed ends. Get it? I KNOW, RIGHT?!?? So go on and make a bunch, till you run out of something. For me I ran out of shrimp first and I made 8 rolls (even though the photo shows 6 I kept going). Now who can say eating healthy and light is boring? Not this girl! I haven’t provided a printer-friendly version of this because it’s so photo heavy. Also do people really print recipes any more? I know I do, but do you? If you want a printer-friendly version of this particular recipe, please comment! No worries, I’ll keep doing printer-friendly versions when I can.